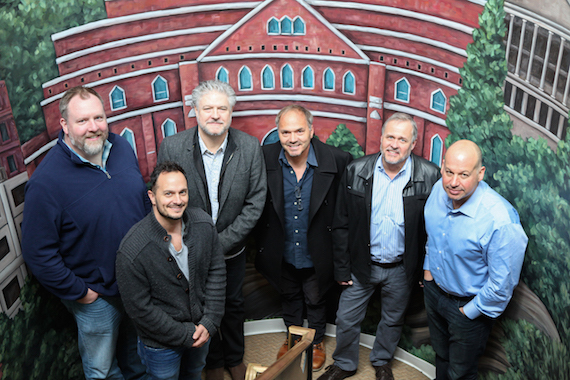 Pictured (L-R): Brian Bradford (Sr. Director of Administration, Spirit Music Nashville); Eric Hurt (Sr. Director of Creative, Spirit Music Nashville); Daniel Hill, (President, Spirit Music Nashville); Marcus Hummon; Billy Lynn (VP, Creative, Spirit Music Nashville); and Jon Singer (COO/CFO, Spirit Music Group). Spirit Music Nashville has signed songwriter Marcus Hummon to an exclusive worldwide publishing agreement, as announced by David Renzer, Chairman, Spirit Music Group and Daniel Hill, President, Spirit Music Nashville. “We have been fans of Marcus Hummon for many years, so it is a great honor and thrill to finally get to work with him. The emotional depth of his music and lyrics is undeniable. Marcus has an amazing creative energy and talent that seem to be as abundant as his musical diversity. We are pleased that he has chosen Spirit to be his publishing home,” said Hill. Among Marcus Hummon’s best-known songs is the hit “Bless The Broken Road” by Rascal Flatts, which won him a Grammy for Best Country Song as well as two Nashville Songwriters Association International (NSAI) awards for Best Country Song in 2005 and 2007. Hummon also wrote hits including “Cowboy Take Me Away” and “Ready To Run” (The Dixie Chicks); “Born To Fly” (Sara Evans); “One Of These Days” (Tim McGraw); and “Only Love” (Wynonna), among others. Hummon has garnered numerous BMI awards (including 5 No. 1 awards) as well as multiple nominations for Grammys, Academy of Country Music (ACM) awards, Country Music Association (CMA) awards and Dove awards. Spirit Music Group, founded in 1995, is headquartered in New York with offices in London, Los Angeles, Nashville and the Netherlands.